Game advert, courtesy of ARRG. This Saturday, our Irn Bruisers will be heading out east to face up to the Auld Reekie Roller Girls' All Stars as part of the Edinburgh Festival Fringe in a celebration of some of the best of Scottish roller derby. Also playing will be the ARRG All Star Rookies who will be taking on Dundee Roller Girls' Bonnie Colliders. For more information and to buy tickets, go here. With that in mind, I decided to go for another expedition into the depths of the internet to see what happened the first time Glasgow Roller Girls met ARRG on the flat track in public! 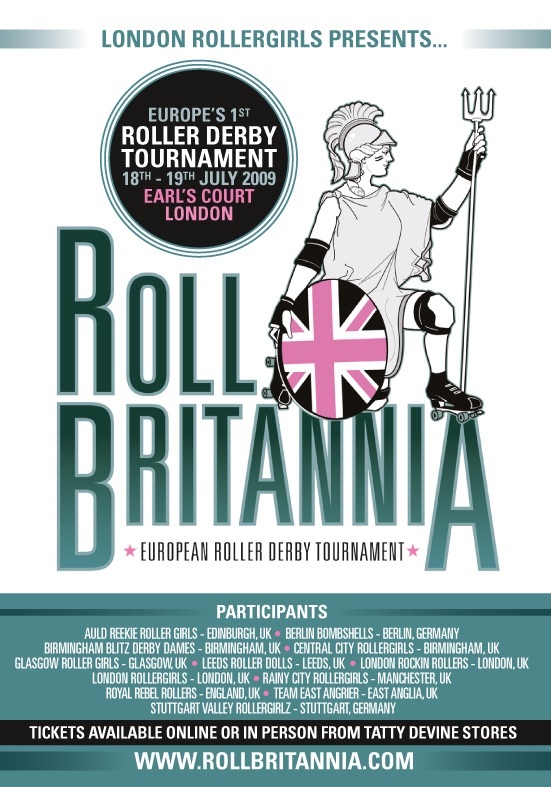 A little over seven years ago, an idea was hatched to showcase Europe's roller derby talents in a tournament and thus Roll Britannia! was born. Hosted by London Roller Girls on the weekend of 18-19 July 2009 at Brompton Hall, Earls Court, it featured twelve teams from across the UK as well as Berlin and Stuttgart. Two of those teams, who faced up to each other for third place, were GRG's Irn Bruisers and ARRG's Twisted Thistles. And while 2009 might seem like a quite a while ago in roller derby career terms, there were some people playing who you can still see on track on Saturday: Sarah McMillan from GRG, Crazylegs from ARRG and Haberbashery who is now a GRD regular but started out in ARRG green. Haberbashery, back in her ARRG days. On the day, Glasgow Roller GIrls were victorious and took third place with a score of 120-70 over ARRG. This took GRG to third place behind London Rollergirls and Birmingham Blitz Dames. For roller derby stats geeks and to see how everyone else got on, here are all the results from the tournament. Were you there? Maybe as a player? Perhaps a spectator? Have you got any better pictures?! Let us know by posting them in the comments!